NOTE TO CUSTOMER – CUSTOMER SHALL BE DEEMED TO HAVE EXECUTED A COPY OF THIS AGREEMENT AND THIS AGREEMENT SHALL BE ENFORCEABLE AGAINST CUSTOMER WHEN CUSTOMER AND VELA HAVE MUTUALLY EXECUTED ANY ORDER FORM, SCHEDULE OR EXHIBIT EXPRESSLY STATING BY ITS TERMS THAT THE SCHEDULE IS SUBJECT TO THIS AGREEMENT. For purposes of this Agreement, each word or phrase listed below shall have the meaning designated below. Other words or phrases used in this Agreement may be defined in the context in which they are used, and shall have the respective meanings so designated herein or in any Schedule executed by the parties. 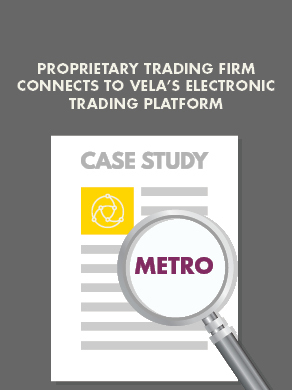 The term “Vela”, where appropriate to give meaning to the usage, shall refer to Vela Trading Systems LLC and its Affiliates. “Affiliate” shall mean and includes any entity that directly or indirectly controls, is controlled by or is under common control with Customer or Vela, as applicable, where “control” means the ownership of, or the power to vote, more than 50 percent of the voting stock, shares or interests of such entity. “Agreement” shall mean this Master License Agreement, together with any Schedules (and any exhibits attached thereto) that may be executed from time to time pursuant to this Agreement. “Defect” shall mean a material defect, failure or malfunction that (a) with respect to the software, prevents the software from producing correct results or (b) with respect to the Deliverables, prevents the Deliverable from operating in accordance with the specifications set forth in an applicable Schedule. “Deliverable” shall mean any software, Third Party Software, professional services, managed services, maintenance services, documentation or other products/services to be provided to Customer pursuant to a Schedule and any Work Product related thereto. “Production Ready” shall mean that a product is determined by Vela to be running in one or more customer production environments. “Schedule” shall mean any order form, schedule or other document entered into by the parties expressly stating that it is subject to the terms of this Agreement. “Third Party Software” shall mean the software owned by a third party and sublicensed by Vela to Customer pursuant to an applicable Schedule, including, without limitation, any updates, upgrades or new releases provided as part of the Maintenance Services. “Work Product” shall mean all ideas, concepts, know-how, techniques, inventions, processes, discoveries, improvements, specifications, designs, methods, methodologies, tools, algorithms, models, devices, systems, reports, studies, computer software (in object or source code), programming and other documentation, flow charts, diagrams and any and all other information or tangible material of any nature whatsoever (in any medium and in any stage of development or completion) relating to any Deliverable that are conceived, designed, practiced, prepared, produced or developed by Vela, Customer or any of their respective Affiliates, employees, agents or contractors before, during or after the course of providing the Deliverables, including any derivative work; provided, however, that the term “derivative work” shall not include any API related development by Customer or any non-Company add-on software linked to or used by Customer in conjunction with Products (collectively, “Customer Proprietary Enhancements”) so long as the Customer Proprietary Enhancements are created and used solely for Customer’s internal operations and Customer complies with the other terms of this Agreement. Agreement. Subject to the terms and conditions of this Agreement, Vela shall provide to Customer the Deliverables as described in one or more applicable Schedules which, upon execution of any such applicable Schedule by the parties, shall (including any Exhibits thereto) become a part of, and shall be subject to and governed by, this Agreement. Supplier of Record. Except as otherwise agreed in a Schedule, Vela shall be considered the supplier of record with respect to the Deliverables included in any Schedule. Term. This Agreement shall commence as of the Effective Date set forth in any Schedule executed by Vela and a Customer and shall continue in force during the Term of any Schedule with a respective Customer. Except as otherwise expressly stated in any Schedule, each Schedule shall have an initial term of twelve (12) months (the “Initial Term”). Executed Schedules will automatically renew on an annual basis for further 12 month periods unless either party notifies the other to the contrary 180 days or more prior to the annual renewal date. In addition to any other termination rights Vela may have in this Agreement or any Schedule, at any time after the Initial Term, Vela may terminate this Agreement and/or any Schedule then in effect for convenience upon 90 days’ notice to Customer in the event it plans to discontinue or substantially modify the respective Deliverable. Termination for Material Breach. In the event of a material breach of a Schedule by either party, the non-defaulting party may terminate such Schedule, in whole or in part, by giving 30 days’ prior written notice to the other party; provided, however, that such Schedule shall not terminate at the end of such 30-day notice period if the party in breach has cured such breach prior to the expiration of such 30-day notice period. Notwithstanding the foregoing, in the event of a breach of Section 4, Section 6 or Section 9 by Customer, Vela may terminate this Agreement and/or any Schedule, in whole or in part, immediately upon notice to Customer. Termination for Insolvency. Either party may terminate this Agreement and/or any Schedule, in whole or in part, immediately upon notice to the other party if such other party (1) is liquidated, dissolved or adjudged to be in a state of bankruptcy or receivership, (2) is insolvent, unable to pay its debts as they become due or makes an assignment to or for the benefit of its creditors or (3) ceases to conduct business for any reason on an on-going basis leaving no qualified successor to perform its obligations hereunder. Upon Termination. Upon termination any and all unpaid amounts are immediately due and payable to Vela, without demand or notice. Within five (5) days after termination of this Agreement or any associated Schedule, Customer shall return to Vela the software and all copies in the form provided by Vela or as modified by the Customer, or destroy the software and all copies, and certify in writing that they have been destroyed. In the event of termination for material breach the termination of the Agreement shall be in addition to and not in lieu of any equitable remedies available to Vela. In the event that Vela terminates this Agreement for convenience under Section 3.1 effective on any date prior to the expiration of the then current Term, Vela shall refund a pro rata portion of any prepaid fees to Customer (or the applicable party under a related Third Party Payment Agreement. License Grant. Vela grants to Customer, subject to the terms and conditions of this Agreement and any additional terms and/or restrictions set forth in the applicable Schedule, a non-exclusive, non-transferable, (except as provided herein), limited license to use the Deliverables included in any mutually executed Schedule for its internal business purposes (subject to any limitations imposed by any owner of any Third-Party Software). Except to the extent authorized or permitted in this Agreement or by applicable law without the possibility of contractual waiver, Customer shall not (1) copy, transfer or distribute the Deliverables (electronically or otherwise), (2) reverse assemble, reverse engineer, reverse compile or otherwise translate or modify the software, (3) use the software as part of a service bureau or (4) sublicense or assign the license for the software or any other Deliverable, including third party market data. All right, title and interest in and to the Deliverables shall remain with Vela, and all right, title and interest in and to the Third Party Software shall remain with the owner of such Third Party Software. If Customer modifies the software in any way or creates any other software based on or using the software, Customer hereby assigns all right, title, and interest it may have in such modifications or software to Vela. Work Product. Unless otherwise specifically set forth in a Schedule, all Work Product shall be the property of Vela and all intellectual property rights in and to such Work Product shall vest exclusively in Vela to the fullest extent permitted under law. Additional Copies. Subject to the terms and conditions of this Agreement, Customer may use one copy of the software solely for the purpose of its internal testing requirements. Customer shall not use such copy in a production environment or to circumvent any of the license restrictions set forth in the applicable Schedule. Third Party Software. Customer’s use of any Third Party Software shall be pursuant to the terms and conditions set forth in the applicable Schedule. Authorized Users and Use of Deliverables. Customer shall use the Deliverables only during the agreed Term and in the manner contemplated and permitted by this Agreement and only for its internal use and purposes. Except as specified in the applicable Schedule, no other person or entity may make any use of the Deliverables or any portion thereof whatsoever. Customer’s contractors, auditors and agents may access and use the Deliverables, provided that all of such usage must be for the benefit of Customer in connection with Customer’s business and pursuant to the terms of this Agreement. Customer shall be responsible for its contractors’, auditors’ and agents’ acts, omissions and compliance with the terms of this Agreement. Moreover, Customer shall not use the Deliverables as a service bureau for any person or entity. Customer is solely responsible for supervising, managing and controlling the use of the Deliverables and ensuring that properly trained staff operate it and follow Vela’s advice and recommendations. Notwithstanding any tools or support Vela provides to Customer, Customer hereby assumes full responsibility for, and shall ensure, compliance with any and all requirements and restrictions of applicable laws, rules and regulations whatsoever, that may apply to the use of the Deliverables. Customer acknowledges that Vela will not be performing any back-ups or other protection of Customer’s data and Customer is solely responsible for such functions. Delivery. In the event that the Deliverable is to be installed on the Customer’s system and not hosted by Vela, Vela shall make available a copy of the software via an ftp site that can be electronically downloaded and installed by Customer and the delivery date is deemed to be the first date the Deliverable is available from the site. In the event that the Deliverable is hosted by Vela, the delivery date will be deemed to be the date the Deliverable is made available for connection to the Customer unless otherwise agreed to by Customer and Vela. Fees. Recurring License Fees for any Deliverable will begin accruing under any Schedule from the delivery date as defined in section 5.1. Any other fees shall be chargeable and payable from the point of execution of the applicable Schedule unless otherwise stated in the Schedule. Unless otherwise set forth in a Schedule, Customer shall pay all fees within 30 days of Customer’s receipt of an invoice from Vela. Any amounts due Vela under this Agreement not received by Vela within thirty (30) days of the due date of an invoice shall be subject to a service charge of one and one-half percent (1.5%) per month, or the maximum charge permitted by law, whichever is less. Price Increases. Once any Initial or additional Terms have expired Vela may at its sole discretion, increase any recurring fees, once a year, with thirty days’ prior written notice to Customer for no more than 5% or the most recent annual increase in the U.S. Consumer Price Index, whichever is greater. Pass-Through Fees. In addition to the Recurring License Fees, Customer shall be responsible for the payment of any pass-through fees from Third Parties as specified on any Schedule. Where a Third Party varies it charges after the date of the applicable Schedule, Vela shall be entitled to pass through any such variation to the Customer on the same terms and Customer shall be responsible for such varied fee. Taxes. Vela may invoice Customer, and in such event Customer shall pay, for all sales, value added, use and similar taxes applicable to the software, Third Party Software and Services provided by Vela in connection with an applicable Schedule. Reimbursable Costs. In addition to the fees set forth in a Schedule, Customer shall pay or reimburse Vela for any out-of-pocket expenses and costs that Vela incurs in connection with the Deliverables specifically at the request of Customer, including, without limitation, subcontracting, materials, travel and travel-related expenses incurred by Vela together with any third-party fees charged to Vela in connection with such work. Maintenance. For the duration of any Schedule. Vela will use commercially reasonable efforts to provide bug fixes, enhancements and code changes in response to exchange specification changes. End-of-Life Support. From time to time Vela may, at its discretion, terminate the maintenance services specified in section 7.1, for a specific release of the Deliverable inline with its software development lifecycle for that Deliverable and shall, where possible, provide a minimum of 90 days’ notice to clients. Support Service Levels. Vela shall provide support services as outlined in its Standard Operating Procedures document which may be updated from time to time. Performance. Unless otherwise specified in an applicable Schedule, the warranty period for the Deliverables shall be three months following the date Vela provides the Deliverable to Customer. Vela represents and warrants that the Deliverables shall be free from any material defects in materials and workmanship throughout the applicable warranty period. If Vela receives notice of a Defect during the warranty period, then Vela shall seek to correct the Defect, at no additional charge to Customer. If Vela notifies Customer that it is not able with reasonable effort to correct the Defect, the applicable Schedule shall be deemed cancelled. Disclaimer of Certain Warranties. EXCEPT FOR THE EXPRESS WARRANTIES SET FORTH IN THIS SECTION 7, THE DELIVERABLES PROVIDED BY VELA TO CUSTOMER ARE PROVIDED BY VELA “AS IS” WITHOUT ANY EXPRESSED OR IMPLIED WARRANTIES OR REPRESENTATIONS OF ANY KIND, INCLUDING, WITHOUT LMIITATION, (1) WARRANTIES AS TO MERCHANTABILITY OR USE FOR A PARTICULAR PURPOSE (INCLUDING, WITHOUT LIMITATION, INVESTMENT DECISIONS), WHETHER OR NOT VELA KNOWS OR HAS REASON TO KNOW OR HAS BEEN ADVISED OF ANY SUCH PURPOSE, (2) WARRANTIES AS TO ANY RESULTS TO BE OBTAINED FROM ANY USE OF THE DELIVERABLES OR INFORMATION DERIVED FROM THE DELIVERABLES AND (3) ANY WARRANTY OF NONINFRINGEMENT. FURTHERMORE, VELA MAKES NO GUARANTEE AS TO THE EFFICACY OR VALUE OF SUCH DELIVERABLES. Receiving and Disclosing Parties. To the extent a party receives or acquires Confidential Information directly or indirectly under this Agreement, it shall be referred to as the “Receiving Party”; to the extent a party discloses Confidential Information under this Agreement, it shall be referred to as the “Disclosing Party.” “Confidential Information” shall mean all tangible or intangible information and materials, in any form or medium now known or hereafter devised (and without regard to whether the information or materials are owned by the Disclosing Party or by a third party). Duty of Care. Each party shall maintain in confidence all Confidential Information received, whether orally or in writing, from the other and shall not disclose or otherwise make available such Confidential Information to any third party without the prior written consent of the Disclosing Party; provided, however, that each party may disclose the other party’s Confidential Information to the Receiving Party’s officers, employees, consultants and legal advisors who need access to such Confidential Information in connection with the Receiving Party’s performance of its obligations under this Agreement, and the Receiving Party may disclose the financial terms of this Agreement to its legal and business advisors and to potential investors if such third parties agree to maintain the confidentiality of such Confidential Information. Each party shall use the Confidential Information only for the purposes of performing this Agreement. Each party shall use the same degree of care to protect the Disclosing Party’s Confidential Information as it uses to protect its own Confidential Information of like nature, but in no circumstances less than reasonable care. Each party shall ensure that any individual or entity receiving Confidential Information for or on behalf of such party under this Agreement shall be bound by terms at least as protective of the Disclosing Party’s Confidential Information as those contained in this Agreement. Accounting for Confidential Information. The Receiving Party shall notify the Disclosing Party promptly of any unauthorized use or disclosure of the Disclosing Party’s Confidential Information and shall provide reasonable assistance to such Disclosing Party, and its Affiliates and licensors, in the investigation and prosecution of such unauthorized use or disclosure. Whenever requested by the Disclosing Party, the Receiving Party shall immediately, at its own expense, return to the Disclosing Party all manifestations of the Confidential Information (except as otherwise required by applicable law) or, at the Disclosing Party’s option, shall destroy, at the Disclosing Party’s expense, all such Confidential Information as the Disclosing Party may designate and deliver to the Disclosing Party a written certification, signed by an officer of the Receiving Party, that all such Confidential Information has been destroyed. Injunctive Relief and Survival. In the event of an actual or threatened breach of this Section 8, the parties agree that the non-breaching party will have no adequate remedy at law and shall be entitled to seek immediate injunctive and other equitable relief, without bond and without the necessity of showing actual money damages. The Receiving Party’s obligations of confidentiality shall survive this Agreement for a period of three years from the date of its expiration or termination, except in the case of trade secret information, in which event such obligation shall survive for as long as such information remains a trade secret. Infringement Indemnity to Customer. Subject to the provisions of Section 9.3, Vela shall have the obligation and right to (1) defend Customer from and against any claims, suits or proceedings brought against Customer by a third party, based upon a claim that any Deliverable provided by Vela to Customer infringes upon any U.S. patent, copyright or trademark (each, a “Claim”) and (2) indemnify Customer against final judgments entered in any such Claim by a court of competent jurisdiction and against settlements authorized by Vela arising out of any such Claim. Vela’s obligations specified in this Section 9.1 are conditioned on Customer notifying Vela promptly in writing of the Claim and giving Vela full authority, information and assistance in the defense of such Claim, settlement negotiations and any settlement thereof. The obligations of defense set forth in this Section 9.1 shall be at Vela’s expense. Vela shall not be liable for costs incurred by Customer in monitoring the defense of any Claim hereunder or any other costs incurred by Customer that are not agreed to by Vela. Vela shall not be obligated to indemnify Customer for any settlement entered into by Customer without Vela’s written consent thereto. Mitigation of Damages. If a Claim has occurred, or in Vela’s reasonable opinion may occur, Vela, at its sole option and expense, may (1) procure for Customer the right to continue using the Deliverable provided by Vela, (2) replace or modify such Deliverable so that it becomes non-infringing or, (3) if neither of the foregoing alternatives is reasonably available, immediately terminate Vela’s obligations (and Customer’s rights) under this Agreement with respect to such Deliverable, refund to Customer an amount equal to a pro-rated portion of the fees paid for the Deliverable. Vela shall not be liable for any claim based on Customer’s use of the Deliverable after Vela has informed Customer of modifications or changes in such Deliverable and offered to implement those modifications or changes at no additional charge. Exclusions. Notwithstanding the foregoing, Vela shall have no liability for any Claim arising out of or based upon (1) the combination, operation or use of Deliverable with equipment, devices or software not supplied by Vela, (2) the alteration or modification of any Deliverable unless such alteration or modification is made pursuant to Vela express written instructions, (3) the use of the Deliverables other than in the specified operating environment, (4) any Third Party Software, (5) any portion of the software that is licensed under any open source software license, including the General Public License or any other license agreement or arrangement obliging a licensee to make source code or object code available to third parties, (6) Vela compliance with Customer’s designs, specifications or written instructions or (7) the use of the Deliverables other than in accordance with the terms of this Agreement. THE FOREGOING, SUBJECT TO SECTION 10, STATES THE ENTIRE OBLIGATION OF Vela, Vela AFFILIATES AND Vela SUPPLIERS, AND THE EXCLUSIVE REMEDY OF CUSTOMER, WITH RESPECT TO INFRINGEMENT OF PROPRIETARY RIGHTS IN CONNECTION WITH THE DELIVERABLES PROVIDED HEREUNDER. Indemnity by Customer to Vela. Customer shall defend and hold Vela harmless for any acts or omissions by Customer, or any of its Affiliates, employees, agents or representatives, resulting in any claim made against Vela with respect to infringement (except for Customer’s authorized use of any Deliverable pursuant to this Agreement and a mutually executed Schedule) or any other matter, including attorney’s fees, court costs and any other costs and expenses reasonably incurred b Vela in such matter. NEITHER PARTY SHALL BE LIABLE TO THE OTHER PARTY OR ANY OTHER ENTITY OR PERSON FOR ANY INDIRECT, SPECIAL, INCIDENTAL, EXEMPLARY, PUNITIVE OR CONSEQUENTIAL DAMAGES, INCLUDING, WITHOUT LIMITATION, LOSS OF DATA, TRADING LOSSES, LOSS OF PROFITS, LOST TIME OR GOODWILL, EVEN IF IT HAS BEEN ADVISED OF THE POSSIBILITY OF SUCH DAMAGES, WHETHER IN CONTRACT, TORT, STRICT LIABILITY OR OTHERWISE. IN NO EVENT SHALL THE MAXIMUM CUMULATIVE LIABILITY OF EITHER PARTY FOR ANY AND ALL CLAIMS ARISING UNDER OR RELATED TO A SCHEDULE, REGARDLESS OF THE FORM OF ACTION, EXCEED, IN THE AGGREGATE, THE TOTAL AMOUNT ACTUALLY PAID BY CUSTOMER TO VELA PURSUANT TO THE APPLICABLE SCHEDULE FOR SUCH DELIVERABLE DURING THE PRECEDING 12-MONTH PERIOD. THE FOREGOING LIMITATION OF LIABILITY SHALL NOT APPLY TO (1) THE FAILURE OF CUSTOMER TO MAKE PAYMENTS, (2) LIABILITY RESULTING FROM THE GROSS NEGLIGENCE OR WILLFUL MISCONDUCT OF A PARTY, (3) CLAIMS AGAINST THE CUSTOMER FOR INFRINGEMENT BASED ON CUSTOMER’S AUTHORIZED USE OF THE DELIVERABLES, (4) CLAIMS AGAINST VELA FOR INFRINGEMENT OR ANY OTHER CLAIM BASED ON CUSTOMER’S UNAUTHORIZED USE OF ANY DELIVERABLE, OR (5) USE OF THE DELIVERABLES OUTSIDE THE SCOPE OF THE LICENSE GRANTED PURSUANT TO THIS AGREEMENT. THE PARTIES ACKNOWLEDGE AND AGREE THAT THE AMOUNTS PAYABLE UNDER THIS AGREEMENT ARE BASED IN PART ON THE LIMITATIONS OF LIABILITY SET FORTH IN THIS SECTION 10 AND THAT SUCH LIMITATIONS SHALL APPLY NOTWITHSTANDING ANY FAILURE OF ANY ESSENTIAL PURPOSE OF ANY LIMITED REMEDY. Customer’s Risk. Customer acknowledges and agrees that Vela’s provision of each Deliverable to Customer under this Agreement does not constitute the provision of investment, financial, tax or legal advice. Vela does not offer and Vela shall not be deemed to have provided any advice regarding the nature, potential value or suitability of any particular security, transaction, investment or investment tactic or strategy. Customer further understands and acknowledges that its use of the Deliverables and any decisions made in reliance on such Deliverables are made at Customer’s own risk. Audit. At the end of each calendar year Customer shall at its own expense supply to Vela reasonable evidence that Customers use of the Deliverables is in compliance with the scope of the license granted herein, for the avoidance of doubt reasonable evidence is considered to be a comprehensive list of Deliverables customer is using including install locations, application instances and core counts in accordance with how such Deliverables are licensed under any applicable Schedule(s). Furthermore, Vela shall have the right to audit Customer’s compliance with the Schedules upon reasonable notice to Customer, and Customer shall provide Vela with reasonable access to Customer’s premises, equipment and personnel as necessary for Vela to conduct such audit. Required Consents. Customer shall obtain any consents as may be required to be obtained from a third party to avoid a misappropriation or infringement of such third party’s intellectual property rights or as otherwise may be necessary for the provision of Deliverables. Assignment. Neither party may assign this Agreement or any of its rights or interests hereunder, nor may any party delegate any obligation to be performed hereunder, without the prior written consent of the other party; provided, however, that either party may, upon notice to the other, assign this Agreement or any of its rights or interests hereunder, or delegate any of its obligations hereunder to (1) an Affiliate, (2) a successor pursuant to a merger, reorganization, consolidation or sale or (3) an entity that acquires all or substantially all of the assignor’s assets; provided, however, that any assignment under this Section 11.4 shall not expand the scope of the license granted herein, if in Vela’s reasonable judgment the assignment of this Agreement to a successor in interest will materially increase the scope of the license granted herein, then the Parties will negotiate in good faith an appropriate increase in the fees hereunder, and if after one month of such event, the Parties cannot agree upon such an increase then Vela may terminate this Agreement on 30 days written notice to Customer. Provided, further, such Customer affiliate or successor in interest is not a direct competitor of Vela. Any attempted assignment or delegation in contravention of this Section 11.4 shall be null and void and of no force or effect. This Agreement shall be binding upon, and shall inure to the benefit of, the legal successors and permitted assigns of the parties. Publicity. Neither party shall use the other party’s proprietary indicia, trademarks, service marks, trade names, logos, symbols or brand names, or otherwise refer to or identify the other party in advertising or publicity releases to third parties, without, in each case, the prior written consent of the other party. Notwithstanding the foregoing, Customer acknowledges and agrees that Vela or a Vela Affiliate may disclose the identity of Customer as a customer in its marketing materials and on its website. No Solicitation. Customer shall not directly or indirectly solicit any Vela employee for employment or services during the term of this Agreement, nor during the 12-month period following the expiration or termination of such Schedule. For the purposes of this Section 11.6, the advertisement of employment opportunities by a party in any public forum (including, without limitation, magazines, trade journals, publicly accessible internet sites, classified advertisements or job fairs open to the public) shall not be considered “solicitation,” and the hiring of an individual as a result of his or her response to such a general employment advertisement or in response to his or her unsolicited employment inquiry shall not constitute a breach of this Agreement. Notices. Any notice, demand or other communication required or permitted under this Agreement may be provided electronically or may be sent by regular mail or overnight delivery, addressed to the Parties at their respective addresses. Compliance with Law. Notwithstanding any other provision in this Agreement, Customer acknowledges and agrees that the Confidential Information, Deliverables and any other items or services provided by Vela to Customer may not be disclosed or distributed to any person or entity targeted by any of the economic sanctions of the United States administered by the United States Treasury Department’s Office of Foreign Assets Control (“OFAC”), any person in any country targeted by such OFAC sanctions or used, in whole or in part, in any way that reasonably could be expected to cause a violation by Vela or any Affiliate of such OFAC sanctions or restrictions on the export, re-export, sale or transfer of goods and technology administered by the United States Department of State or United States Department of Commerce. Independent Contractor. Vela, in the provision of Deliverables hereunder, is acting as an independent contractor. Personnel supplied by Vela in connection with this Agreement are not Customer’s employees or agents. Choice of Law and Jurisdiction. The substantive laws of the State of New York shall govern this Agreement as though this Agreement was entered into, and was to be entirely performed within, the State of New York. The parties expressly disclaim the applicability of, and waive any rights based upon, the Uniform Computer Information Transactions Act, the United Nations Convention on the Sale of Goods and the Convention on the Use of Electronic Communications in International Contracts. All claims or disputes arising out of or in connection with this Agreement shall be heard exclusively by any of the federal or state courts of competent jurisdiction located in New York, New York, U.S.A. To the fullest extent permitted by law, each party hereby expressly waives (on behalf of itself and on behalf of any person or entity claiming through such party) any right to a trial by jury in any action, suit, proceeding or counterclaim of any kind arising out of or in any manner connected with this Agreement or the subject matter hereof. Force Majeure. A party shall be excused from a delay in performing or a failure to perform its obligations under this Agreement (except for payment obligations for which this Section 11.11 shall not apply) to the extent such delay or failure is caused by the occurrence of any contingency beyond the reasonable control, and without any fault, of such party. In such event, the performance times shall be extended for a period of time equivalent to the time lost because of the excusable delay; provided, however, if the delay or failure continues for more than 30 days, the party not relying on the excusable delay may terminate any affected Schedule in whole or in part, upon notice to the other party. Construction, Interpretation, Amendments and Waivers. This Agreement constitutes the complete understanding of the parties, and supersedes all prior or contemporaneous agreements, discussions, negotiations, promises, proposals, representations and understandings (whether written or oral) between the parties, with regard to the subject matter hereof. Each party acknowledges and agrees that any interpretation of this Agreement shall not be construed against a party by virtue of its having drafted the provisions hereunder. The terms, conditions, covenants and other provisions of this Agreement may be modified, amended, supplemented or otherwise changed only by a written instrument (excluding e-mail or similar electronic transmissions) that specifically purports to do so and is physically executed by a duly authorized representative of each party. If a court of competent jurisdiction declares any provision of this Agreement to be invalid, unlawful or unenforceable as drafted, the parties intend that such provision be amended and construed in a manner designed to effectuate the purposes of the provision to the fullest extent permitted by law. If such provision cannot be so amended and construed, it shall be severed, and the remaining provisions shall remain unimpaired and in full force and effect to the fullest extent permitted by law unless the essential purpose of this Agreement would be affected, in which case this Agreement shall terminate. This Agreement may be executed in counterparts, each of which shall be deemed to be an original. No provision of this Agreement shall be deemed to have been waived by any act or knowledge of either party, but only by a written instrument signed by a duly authorized representative of the party to be bound thereby. Waiver by either party of any default shall not constitute a waiver of any other or subsequent default. Conflict. In the event of any inconsistency between the provisions of this Agreement and any Schedule, the express provisions of the Schedule shall govern for purposes of such Schedule only. Survival. The provisions of this Agreement that, by their nature and content, must survive the completion, rescission, termination or expiration of this Agreement in order to achieve the fundamental purposes of this Agreement shall so survive and continue to bind the parties. Without limiting the generality of the forgoing, the parties specifically acknowledge that the following provisions of this Agreement shall survive: Section 4, Section 6, Section 7.3, Section 8, Section 9, Section 10, Section 11.1, Section 11.5, Section 11.10 and this Section 11.14. AUTOMATIC RENEWALS – AS SET FORTH IN SECTION 3.1 ABOVE, THE TERM OF ANY SCHEDULE WILL AUTOMATICALLY RENEW UNLESS PROPERLY TERMINATED PURSUANT TO THIS AGREEMENT.